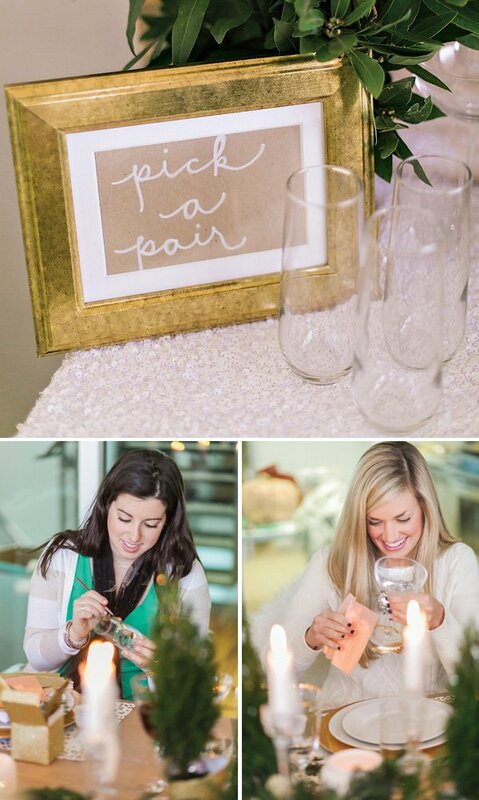 Crafting, wine, girlfriends, and a whole lotta sparkle? Yes, please! 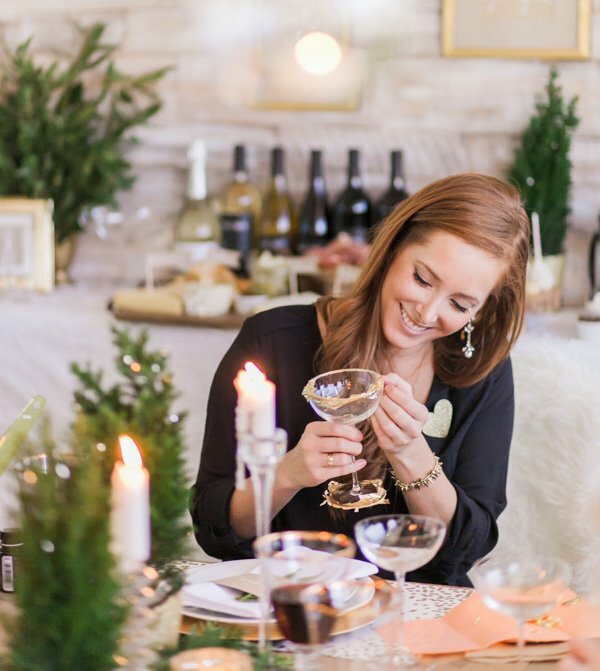 This beautiful, gold be-decked Holiday Wine & Crafting Party from Megan of ONEHOPE Wines just looks like the perfect way to soak in the joy of the season… and that’s exactly why Megan decided to host it in the first place! 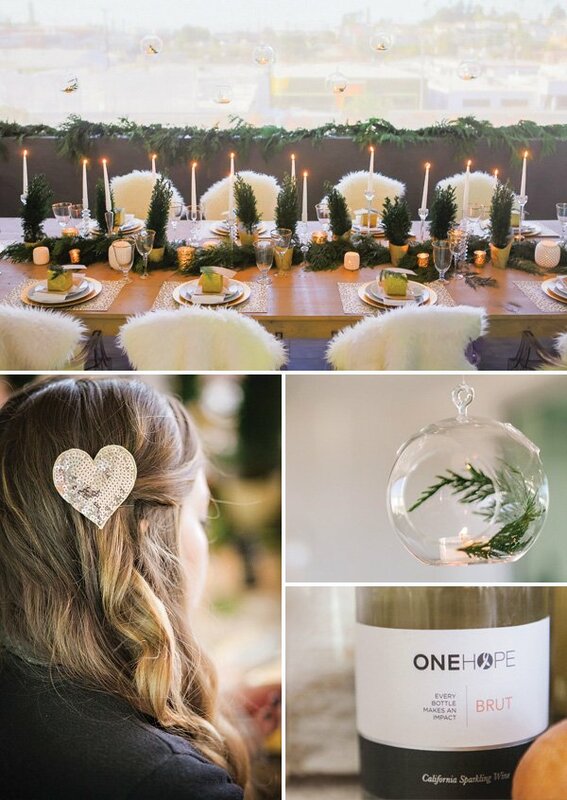 I love all the thoughtful touches featured here – from beautifully scripted place cards, to a fun gold leafing activity for the guests, to the Hope at Home wine tasting from ONEHOPE, which raises money for the party host’s charity of choice. 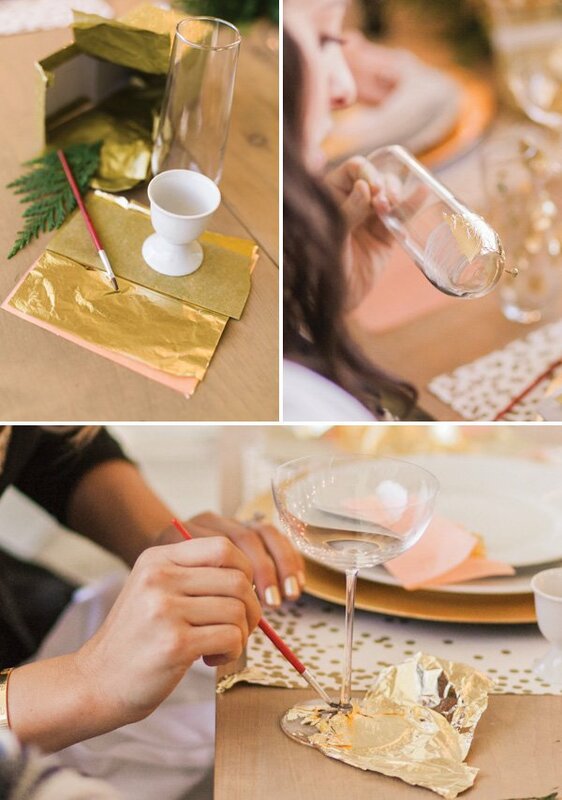 Scroll down for more info this fantastic program + fabulous holiday inspiration and DIY Details on the gold leaf champagne glasses. 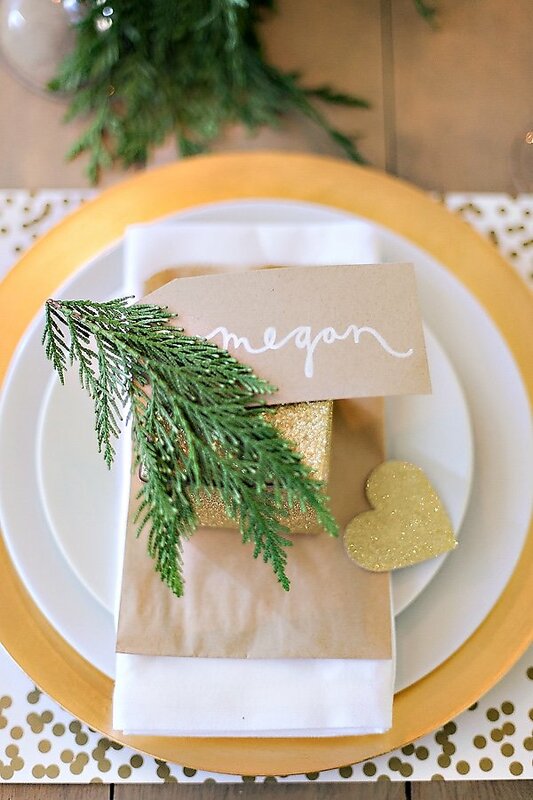 – Glittery gold boxes for each guest, filled with supplies for the gold leafing activity! Being in the wine industry, almost 75% of our business is done in November and December, just before the holidays, so it makes for a really busy 7 weeks! In 2012, the holidays seemed to pass in the blink of an eye. So this year, I wanted to make sure that we set some time aside to enjoy the season and spread the cheer. 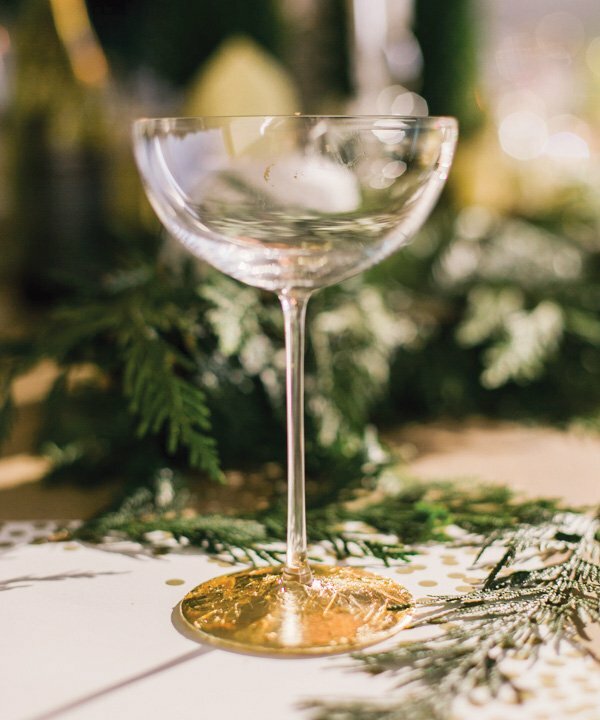 Since classic gold and mixed metallics are so on trend, we decided to host some friends for an afternoon of gold leafing champagne glasses to give as gifts while sipping on wine and listening to our favorite holiday tunes. 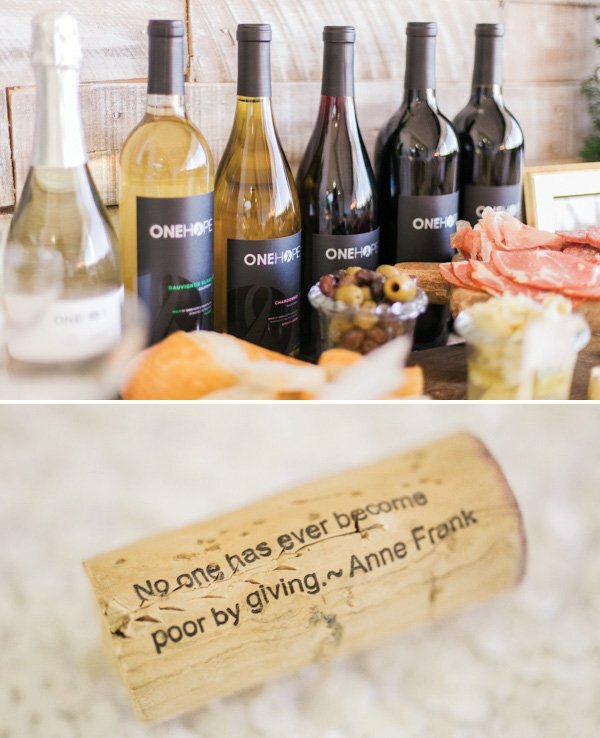 In the spirit of the season of giving, we hosted our first ever ONEHOPE Holiday party with Hope at Home — ONEHOPE’s exclusive at-home wine tasting program that raises money for the hosts’ cause of choice. In addition to the half of profits that our wine already donates back to partner charities to make a social impact, with Hope at Home an additional 15% of sales from the evening is donated back to a cause of choice. An afternoon of wine tasting and holiday crafts, while also giving back? WINE not?! 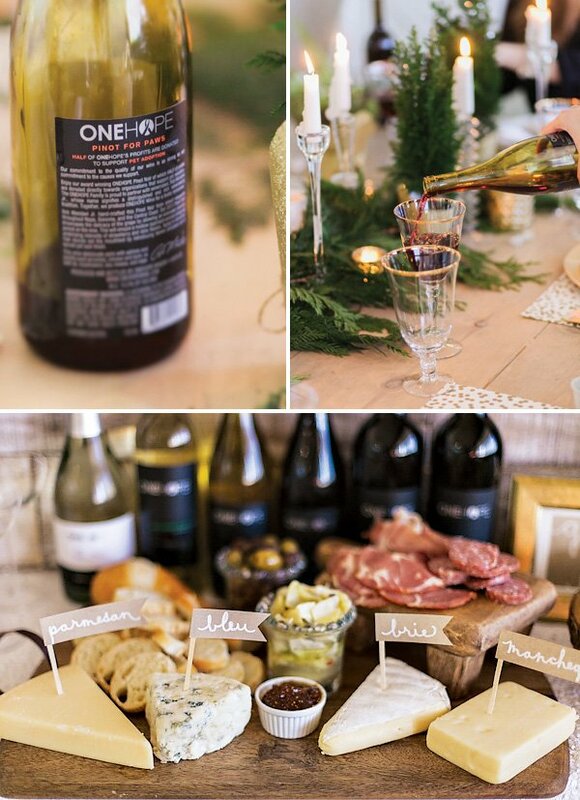 To feed our guests, we kept the menu simple with a cheese plate comprised of a mixture of cheeses and finger foods that pair perfectly with wine. To create your own cheese plate for a wine tasting, consider cheeses with variable textures, ages and flavor profiles. Also include bread or crackers, something a little sweet (honey or figs) and a meat or two. Our cheese plate included parmesan, bleu, brie and manchego cheeses with sliced French bread, olives, fig spread, artichoke hearts, prosciutto and salami. 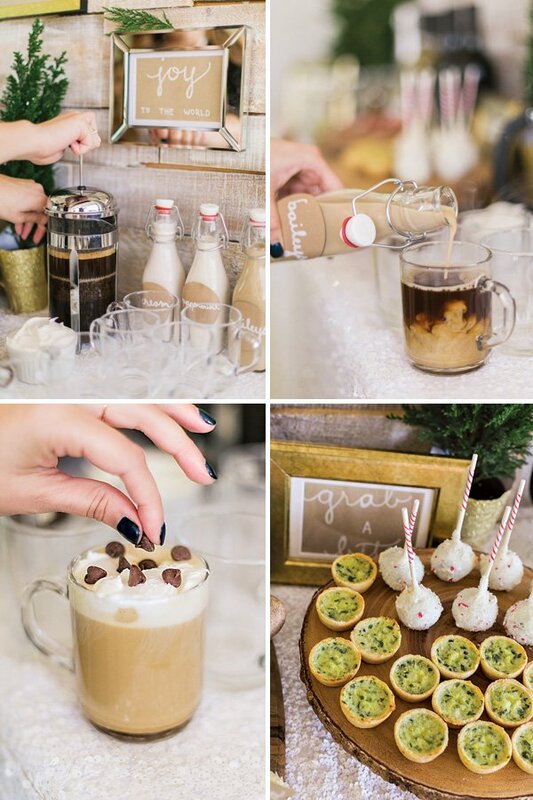 Guests also nibbled on mini quiches and enjoyed peppermint cake pops and a coffee bar for dessert. DELICIOUS! 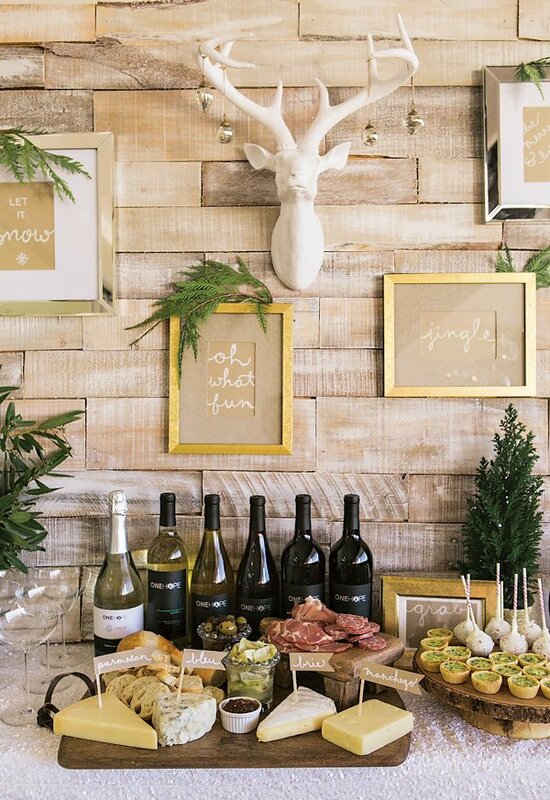 To include a unique wine tasting experience at your home or office party, check out Hope at Home and learn how you can host a party to raise money for the cause of your choice. 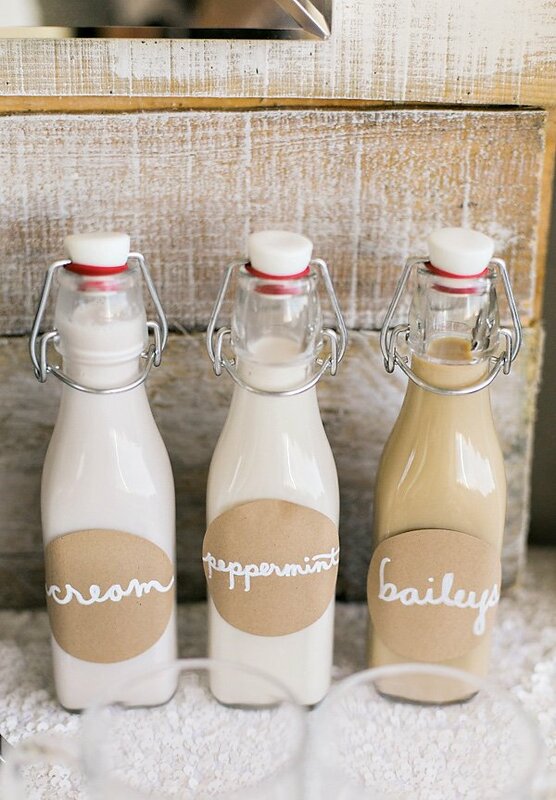 – Flutes or Champagne Coups – We used these and these to give our guests a little variety. 1. Using a paint brush, apply adhesive to the glass. Get creative with shapes and stripes! 2. Wait a few minutes until the glue gets tacky (2-5 minutes). We had the best luck when the glue was almost dry. 3. 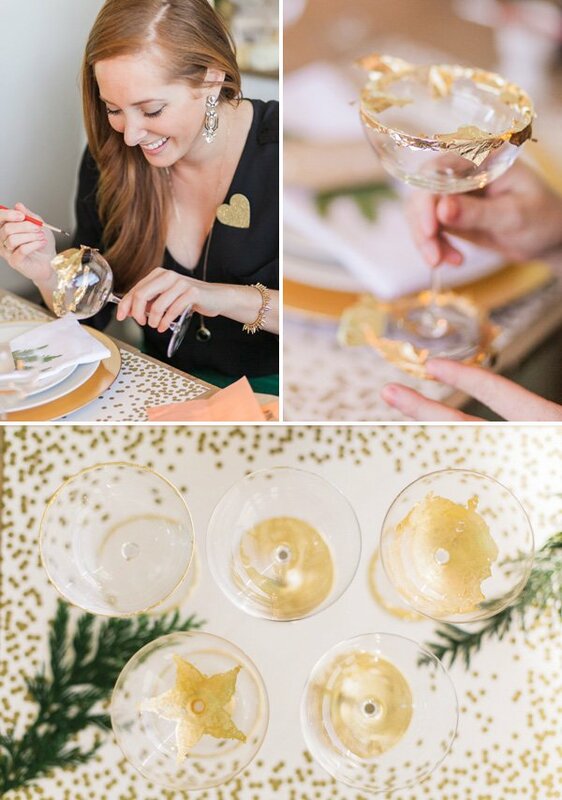 Place your gold leaf on the glass and press down to smooth out any bubbles or inconsistencies. 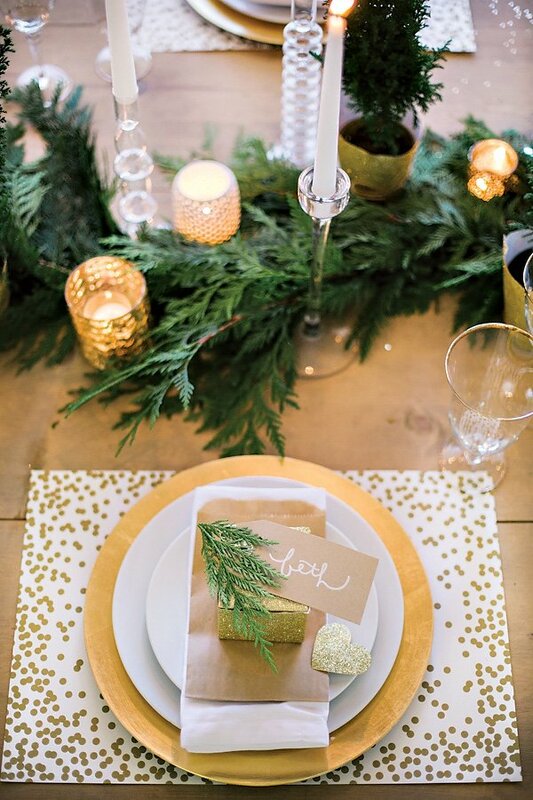 Allow your gold leaf to set for 15-20 minutes. 4. Carefully remove excess gold leaf from around the glued areas. Where are the candlesticks from? They're super cute! 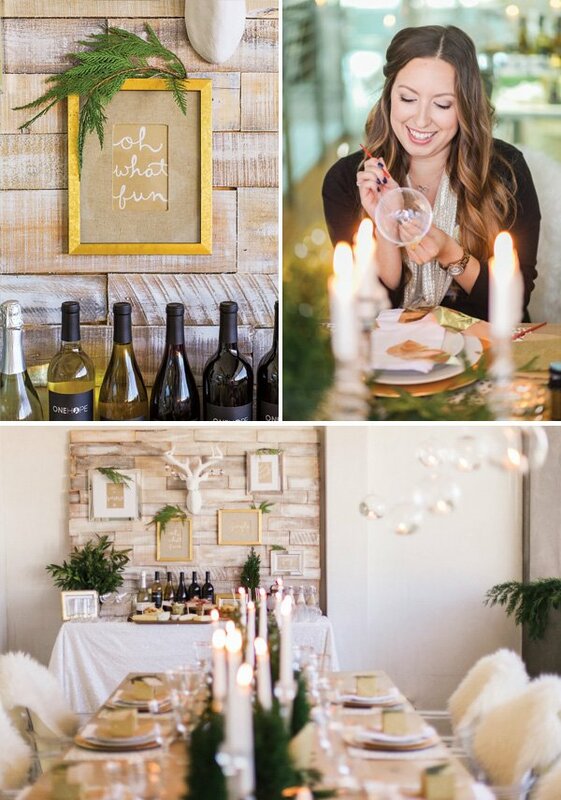 cool blog to published about wine crafting party..